The Educational Disc Golf Experience (EDGE) has been developed to provide schools and other youth programs with a sound program of teaching disc golf fundamentals and allied skills. Contributions from World Champion disc golfers, educators, and a recreation therapist have injected a great variety of skills and approaches to bringing this subject matter to life. With lessons linked to everyday classroom topics, EDGE helps students understand the importance of math, science, citizenship, fitness, nutrition, and environmental studies, as they apply to disc golf. Resource materials, lesson plans, student worksheets, and related materials are available for varying grade levels. Our goal is to provide you with a program that can help students learn from and enjoy this wonderful lifetime sport. We also hope that students whom take up the sport will invite their families and friends to benefit from better health, fitness, and social awareness by playing disc golf. EDGE is a recognized non-profit educational corporation under Section 501 (c) 3 of the Internal Revenue Code. From introducing disc golf to young players, to reinforcing classroom skills through a new activity, to developing lifetime habits of exercise and fitness, EDGE is designed to give teachers and youth program leaders the tools they need to succeed. The US Department of Health has recommended at least 60 minutes of moderate to vigorous activity for youth between the ages of 5 and 18. Many other National Health Organizations have stated that a healthy lifestyle consists of taking 10,000 steps each day. An average round of disc golf can be played in 60 to 90 minutes and involve anywhere from 5,000 to 8,000 steps. Playing a round of disc golf can have a person well on their way to meeting the recommended goals of a healthy lifestyle. Not to mention having a great time while you are at it. 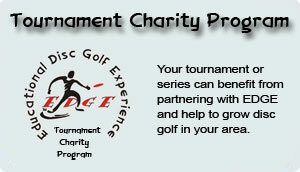 The EDGE Program is the first endorsed school based curriculum to effectively teach the basic skills of disc golf. The EDGE Program follows NASPE national standards and combines teaching the fundamentals of the sport with the educational objectives of science, civics, and the environment. EDGE begins with lessons teaching basic throwing skills, course play, and initial discussions of rules and courtesy. More advanced lessons delve into the science of disc flight, the mathematics of scoring, handicapping, statistics, environmental concerns, and civic responsibility as a player. The final phase ideally entails a competitive club disc golf league between area schools. We believe that the EDGE Program is one of the ways to get our children active in the battle against obesity. Beyond teaching the basics of a lifetime sport, EDGE teaches children valuable life lessons. In this couch potato, media driven, and video game era, help us get our children back into the active outdoors by getting EDGE into your local schools or youth program. 1. Ogden CL, Carroll MD, Curtin LR, McDowell MA, Tabak CJ, Flegal KM. Prevalence of overweight and obesity in the United States, 1999-2004. JAMA 2006;295(13):1549-1555.